Lemon Balm is a wonderful aromatic plant whose lemony smell brings joy to anyone who comes near it. It's a cooling mint that supports digestion and for many, it's a go-to herb for stress and mild depression. Lemon Balm uplifts the spirit and calms the mind while keeping us sharp and engaged. 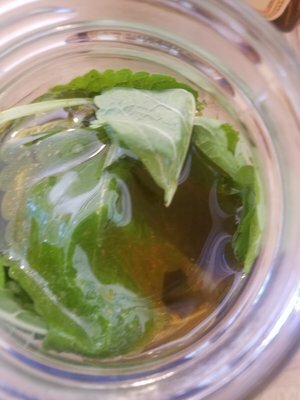 Lemon Balm is in full bloom right now in many gardens and what better way to enjoy it — besides rubbing it all over your hands and breathing it in deeply which I like to do — than by making a Lemon Balm Elixir and sharing it with friends! Elixirs are a fun and delicious way to work with aromatic herbs. They can be enjoyed straight over ice, added to drinks or club soda, and even used as an ice cream topper. So let's get to it so you can go out in the garden and get started! Strain out Lemon Balm leaves & enjoy! *Another method is to finely chop the leaves. This releases more of the aromatics and creates more surface area and possibly a stronger tasting elixir. I did this with a Mint Elixir I recently made because the leaves didn't smell very minty. But, once I chopped them up - whoa... Minty delight! I added the leaves to a food processor with a small amount of brandy to finely chop the leaves, then added that mixture a jar and added more brandy and honey like above. To be honest, we start using Elixirs WAY before 4 weeks, but the longer you let it sit, the more tasty it will become so make plenty!